With its attention documentary detail, real-time sequencing, minimal mood music, and black and white cinematography, The Train is in the tradition of Italian neo-realism... even though it was filmed in France by an American director and features an American star. Films about Nazi villainy tend to be costume dramas with limited characterization, easy propaganda and violent solutions. Exceptions exist: Visconti's The Damned, for example, or even Litvak's The Night of the Generals. The Train is violent, but violence is not its vocation. Violence exists as a detail in the industrial landscape, where humans are cultured by their machines and the iron horse they ride. The action is male, the art is female... and once again men fight over her, although this time she is pure symbolism, crated in boxcars heading for the museums of the Third Reich. The plot is superb. You can have people talk about art and what it means as a physical example of the cultural and spiritual identity of a people, but without a clear example of what it means to be without art, all the talk in the world doesn't do it. The conqueror has always removed booty for his pleasure -- Napoleon did it when he invaded Egypt, and no doubt MacArthur did it when he invaded Japan. A German army officer called Colonel Von Waldheim (Paul Scofield) decides to ship the best of France's modern art collection back to Berlin before the Allies reach Paris and separate him from his obsession forever. To do this, he needs a train to ship his crated booty... but due to the imminence of the Allied advance, Von Rundstedt -- Commander of the German Western Front -- has detailed all moving stock for the German pullback. Using the irrefutable argument that "art is money", Von Waldheim manages to secure an old steam engine and sets about press-ganging a French crew to drive the "art train" to Germany. Enter Labiche (Burt Lancaster), the superintendent of the locomotive yard... and French resistance operative. While Labiche might know something about switching freight trains and repairing broken steam engines, he knows and cares nothing about art. When Miss Vallard (Suzanne Flon) the curator of the gallery approaches him about stopping the theft, he suggests blowing up the train... and the art. When Colonel Von Waldheim approaches him for an engine, he tells him they've all been requisitioned by General Von Rundstedt. Labiche is a pragmatist... and his utilitarian patriotism is the ideal dramatic foil for Von Waldheim's Bauhaus idealism. While you learn nothing about the personal histories of either man, their characterizations are a brilliant gestalt of body language and visual metaphor. There is really no acting here -- both exist as reincarnations of history. Forget the easy lunacy of comic books and revisionist histories -- these are men with a job to do. Sabotage and executions occur with the impersonal objectivity of documentary fact. No one is acting for the camera. The Colonel stands in the gray industrial landscape, a squad of soldiers stiff in the background, MP 40 sub-machine guns clutched to their chests, the shining empty tracks converging in a distant vanishing point. The isometrics are stunning, like this immaculate patrician in the Nazi officer's uniform. And the art? Cezanne, Braque, Matisse, Picasso and all the rest? You never really see it. Once crated, it exists as an ideal, and the real art becomes the landscape. The Train has to be one of the best photographed films ever. The cool semi-tone renderings of de Sica's Indiscretion of an American Wife come to mind but this is way beyond that. Or the expressionist rapture of Welles' last action painting, A Touch of Evil... if you think in terms of long tracking shots and uninterrupted sequences. Frankenheimer does it all. And without the easy melodrama of special effects and the pretty face. Consider the Vaires yard scene. Here you see Labiche in the signal box supervising the line-switching as two trains are organized -- the art train and the armorment train. He is also coordinating his movements to a third action -- a ten a.m. air attack by the Allies on the German armorment train. At this juncture, he seems willing to sacrifice the entire twentieth century legacy of French art in order to ensure the immediate goal, the defeat and route of the Germans from France. With a Nazi officer at his shoulder, you see him bark out commands to the switching man: "Row 5... Row 8... Row 10...." On Row 10 the shifter jams and the ugly armor-plated engine with its camouflage paint and German cross decals is unable to exit the yard... and thereby becomes an inevitable casualty of the bombing run. You see all this as if you're watching a squad of carpenter ants organizing their next campaign. The long view is through Labiche's binoculars... later through the bombing window of a B-26. Soldiers move listlessly among the rows of tracks as the flat beds with their tanks and artillery guns await their engine... and Colonel Von Waldheim awaits his art train. The choreography of man and machine here is excellent. It develops like a chess game, ends like what it really is: war. The art train survives this attack but Von Waldheim suspects Labiche is the real saboteur. He orders Labiche to drive the engine to Germany. Here Labiche and his resistance comrades outwit Von Waldheim completely by routing the art train into a circularity, the deception achieved by changing the names of the stations temporarily as the train roars through. 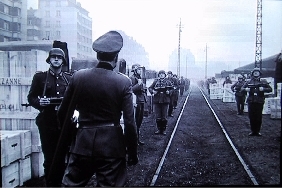 When they eventually pass through "Zweibrucken" it's really Vitry and the Nazis are no closer to home than they were from the outset. They awake at dawn to find themselves boxed between two staged engine wrecks. Usually when Nazis are fools, we are the bigger fools for believing it. But the deception here is so skilfully executed, it becomes symbolism rather than racial politics. Orson Welles said, "The enemy of art is the absence of limitations." John Frankenheimer would agree, as this deception of circularity was his solution to having only one railway station to work with as his set. Brilliant? Of course. "beauty belongs to the man who appreciates it"
While the face-off is a stock situation in film and usually resolves as a fight, the cliche is swept away by the integrity of the acting. The understated beauty of Scofield's performance is classic. "He's so good," murmurs Frankenheimer on the director's commentary track that comes with the DVD... and of course he's saying what you've been thinking. The same when he observes that Burt Lancaster has the best movement of any actor of his generation... you marvel at the old trapeze artist's casual grace and animal agility. 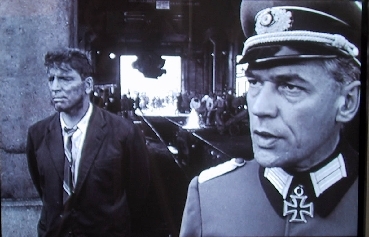 Frankenheimer quite rightly draws attention to Lancaster's swift circus descent from the signal box during the bombing raid at Vaires... and how he jumps onto the passing engine and completes the routine by doing his own fall. No stuntmen here. It's this ability to represent the character entirely that makes possible the long camera shots that make The Train a masterpiece of real-time sequencing. For students of film, this DVD version of The Train is a lesson in the Hollywood method at a time when the Hollywood method still meant something. Watch with Frankenheimer and hear him explain his set-ups, marvel at his actors, recount his experience in France... after, of course, you've ridden the art train.